Ah, another new year. A time for making resolutions, mostly centred on the theme of a “new me”, which means actually going to the gym I pay my membership for, and actually eating the rabbit food I prepare for lunch (it’s a cruel world). 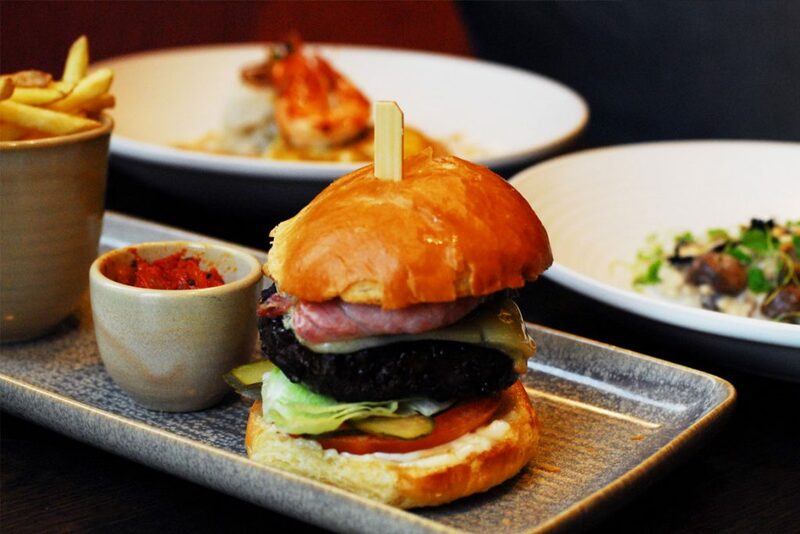 Well it’s a nice idea, but when the manager of Brasserie Blanc (Raymond Blanc’s famed chain restaurant) invites you and the team to sample some culinary delights at their recently appointed Bournemouth site, those resolutions seem like a distant—and swiftly unimportant—memory. 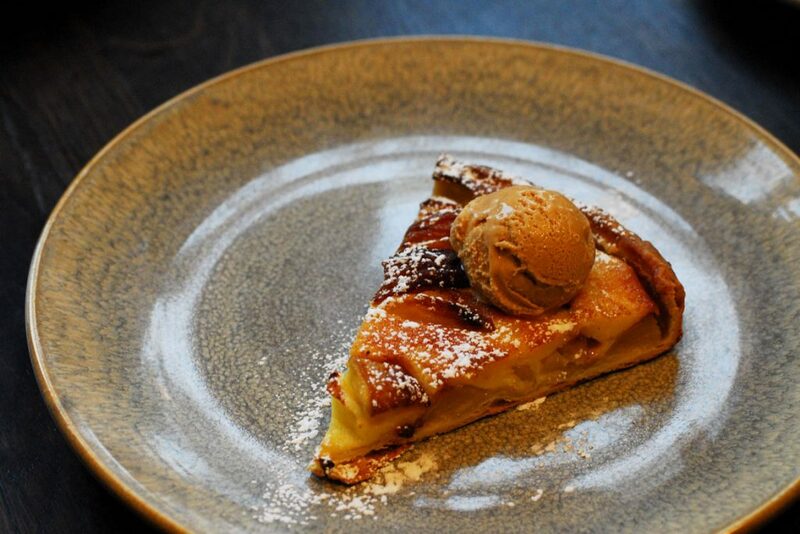 We arrived at Brasserie Blanc one otherwise ordinary Monday afternoon, excited at the prospect of a delicious start to the working week. We wandered in through the street entrance (adjacent to the main Marriott hotel access), up the ornately tiled stairway, into a gorgeously decorated grand café. Antiquated mahogany tables with traditional bentwood chairs populate the room, dressed simply with a crisp white towel napkin, unpretentious silver, and gleaming glassware. Framing the space are plush velvet benches that hug the corners and crannies of the room, brushed in beautiful contemporary colours such as dusty pink and soft gold—a vivacious contrast to the purposely distressed grey walls. We were sat on a curvaceous booth that overlooked the entire restaurant, with an expansive view of the sea-surrounded horizon just outside. Our culinary journey began (as most do) with a perusal of the menu. The quarterly menu theme was “a wonderful mix of French classics, warming winter dishes and mouth-watering flavour combinations”—as stated on their website—and sure enough, we all found something we liked the sound of, but none of us were in a fit state to make final decisions, not before a little tipple anyway…with that the sommelier arrived and we each made our demands, which were quickly noted and met. With a little glass o’ New Zeeland Sauvignon in hand, I could finally concentrate and submit my order—cheers to that. To start, I opted for the Scottish Salmon: a perfect little just-cooked fillet of fish, served with a trio of colourful beetroot, cauliflower florets, and a horseradish crème fraiche. Admittedly I was initially taken aback, half expecting the dish to be an entirely cold starter, but as it turned only some elements were, and the fish itself was warm—perfectly cooked—but perhaps not what I was expecting. All of the other elements were fresh and vibrant, but I can’t deny my longing for a pinch more of that horseradish crème fraiche, just to give it an added kick (which I’m sure the chef will wish for me now). Across the table my colleague Matt was tucking into an iconic French dish ‘Escargot’, which was delicious; covered in moreish garlic butter that spread over the meat like a silken blanket. Next to me Vicky was relishing her Cheese Soufflé, mostly with orgasmic dins, but she did pause long enough for us to ascertain that the sauce was of “gooey moreish-ness”. We took that as a resounding yes from her. For main I accidentally decided to go with a vegetarian option, but when a dish has the three Cs (cheese, cream and character) who cares. 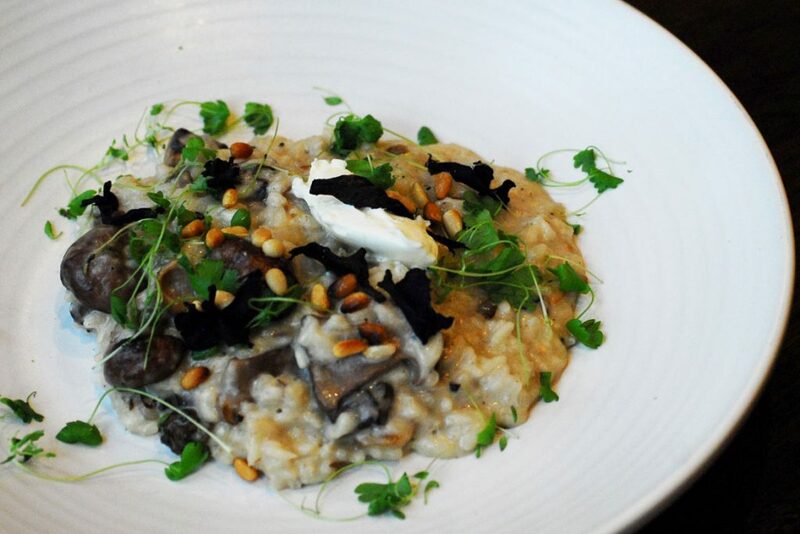 The rice was well cooked—not too gluggy—as were the mushrooms and the mascarpone cream sauce was moreish: an all around pleasant dish. For dessert, there was one thing, and one thing only that I was going to have and that was the signature BB Pistachio Soufflé. I have something of a Saturday morning ritual at home, in that I love to watch cookery programs—inspiration for the weekend ahead. 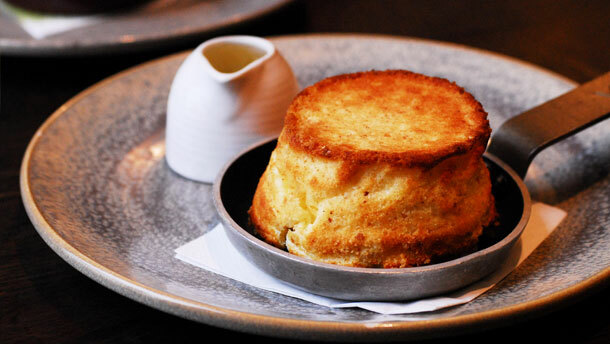 Funnily enough, the weekend just gone I had been watching Chef Raymond Blanc’s show, where he was whipping up a sweet soufflé, so the bar had firmly been set by the master himself. 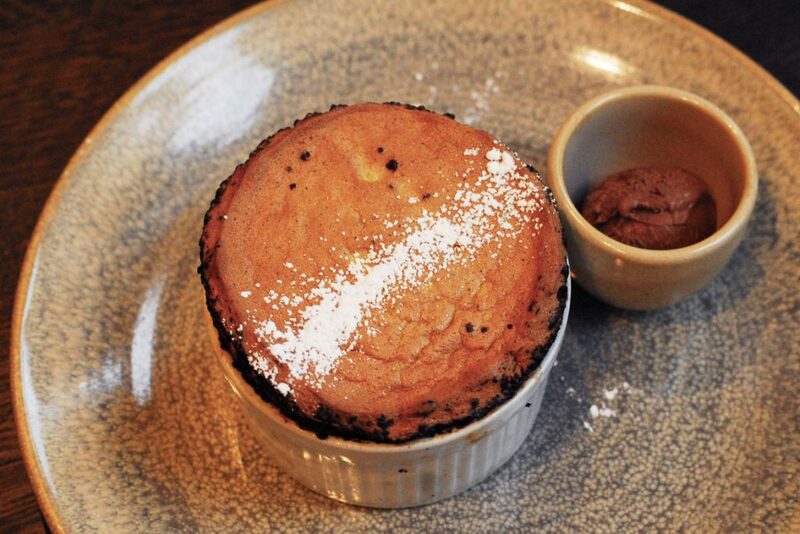 True to form, the soufflé was sublime; it was a nutty and sweet and not to mention light as a feather, and the rich chocolate ice cream on the side made for a decadent addition. 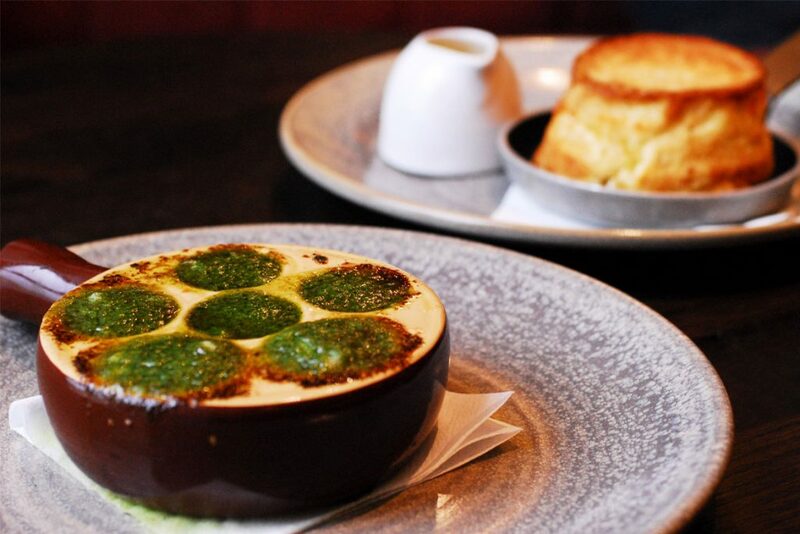 All in all we had a very pleasant time at Brasserie Blanc, and I would certainly recommend getting your hands on one of those Pistachio Soufflés! Pssst, don’t miss out on their current special offer. Sign up to the Brasserie Blanc database today to receive 50% off all à la carte mains and specials until the 11th February.